In the world of affordable hatchbacks, the Hyundai Veloster is the beret-wearing, chain-smoking beatnik who's brave enough to live life at 90-degree angles to what's currently trendy. "Look at me with my three doors," it seems to say, flaunting its asymmetry as a form of slam poetry written in steel and glass. "See how little I care for your cookie-cutter templates," it whispers to you in the showroom, daring you to join in its celebration of the unusual. But if the Veloster is a hipster, it's one with a trust fund: Hyundai's deep pockets are part of what allows it to challenge entry-level convention. It also means that when the hatch wants to give up nicotine and caffeine, hit the gym, and shave off its dreads, Daddy can afford the bill. 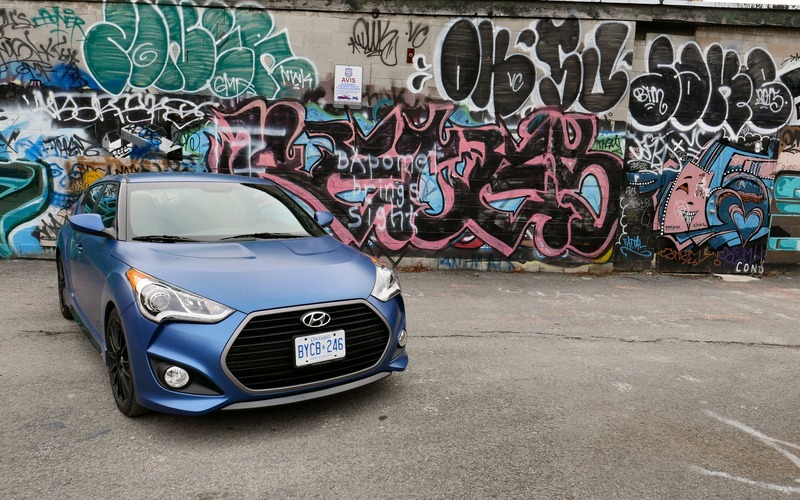 The end result - the 2016 Hyundai Veloster Rally Edition - proves that broing it up can't always hide your roots, but it can make for a more intriguing version of a car that has yet to find its footing amongst Canadian buyers. I've always found the single driver-side door / double passenger-side door setup of the Hyundai Veloster to be appealing, but then again, I've got a thing for weirdoes. The Rally Edition is guaranteed to draw even more eyes than the standard version of the car thanks to the inclusion of matte blue paint as part of its array of carefully-selected cosmetic upgrades. You also get RAYS wheels (each just over two kilos lighter than the stockers), bright blue Turbo lettering and piping on the car's leather-wrapped sport seats, the appropriate badging inside and out, and more aggressive-looking trim to mark your presence as the pilot of a sufficiently tanned-and-toned ride. However carefully sculpted they might be, unfortunately the Rally Edition's muscles are just for show - there's no concomitant power boost from the 1.6-litre turbocharged four-cylinder engine compared to any other version of the Veloster Turbo, meaning it pushes out 201 horses and 195 lb-ft of torque (sent to the front wheels via a six-speed manual gearbox outfitted with a B&M shifter). The chassis does benefit from a somewhat limber suspension setup, but it's more yoga class than Baryshnikov when it comes to the corners: you're not going to pull a hamstring hustling the Hyundai through the turns, but you're equally unlikely to come away feeling particularly inspired. It might seem like I'm damning the 2016 Hyundai Veloster Rally Edition with faint praise. While the changes to the vehicle's personality might be largely superficial, that doesn't make them unwelcome. If you can handle the extra care that the Rally Edition's matte paint requires to continue absorbing, rather than reflecting the rays of the sun, then you'll be pleased with how well it shows off the contours of car. It already cuts a sharp profile compared to a few of the more mundane (Sentra) options (Yaris) at its price point, and the cabin is comfortable for those riding up front and tolerable for rear seat occupants over short distances (and that extra door means there's no tilting and clambering over seats to scramble inside the car). Cargo space also improves dramatically if you fold down the back row, giving you access to almost as much room as you'd find in a subcompact crossover like the Mazda CX-3. It's true that if you're looking for a sub-$30k performance car, then you'd be better served elsewhere - Ford's line of ST models springs to mind, as does the Volkswagen GTI - but despite the Veloster Turbo's failure to live up to the hype of its name, the car drives noticeably better than it did when it was first introduced. Traction control is no longer as intrusive when shifting at redline, power delivery is smoother, and torque is readily available in almost any forward gear. It's an easy vehicle to live with, and if it had perhaps an additional 50 horsepower on tap, it may very well find itself better prepared to do battle on the compact performance stage. The 2016 Hyundai Veloster Rally Edition is not the best choice in its class, but it's definitely a fun choice. I don't mean in the handbrake-turns-and-tires-smoke sense of the word, but more the special-edition-Sunday-car-meet definition. The Rally Edition actually costs the same as the base Veloster Turbo - $27,199 - and while you have to trade gear like the former's available panoramic sunroof to get it, there's no question that the Rally Edition allows you to access custom cool without denting your pocketbook. For some buyers, looking the part is more important than bragging around the water cooler about track-ready performance few will rarely ever tap into on the street. Just hope no one asks you to defend your honour at the next stoplight. 7/10	Not the most frugal of compact hatchbacks. 8/10	I didn't find that the stiffer suspension compromised ride quality. 7/10	It's not in the same league as other sporty compacts. 8/10	No problems to report with Hyundai's infotainment interface. 7/10	Easy to drive and smooth as a commuter. 7/10	Looks great, but average performance holds it back from the rest of the entry-level Fast and Furious pack.